A dynamic stamp is simply any image or graphic that displays your name, date, and time on the stamp. It’s considered dynamic because the exact date and time that you apply the stamp is displayed every time you use it. Dynamic stamps obtain information from your system for the time and date, and from the Identity panel of the Preferences dialog box for your name. You need Acrobat to create a dynamic stamp but once it has been created it can be used in either Acrobat or Adobe Reader (version XI only). 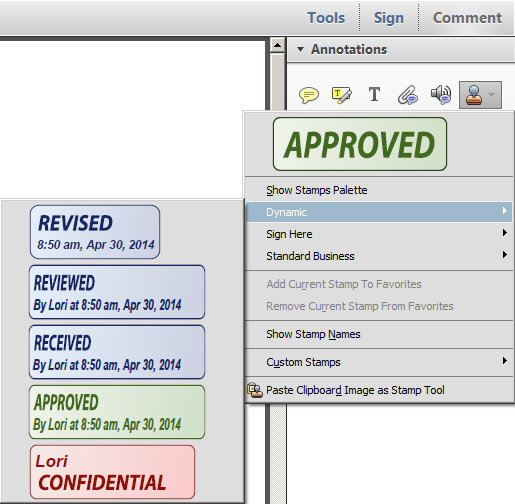 Dynamic stamps are located in the Comment pane under the Annotations panel in either Acrobat or Adobe Reader XI. Now if all you need to do is modify one of the existing custom dynamic stamps in the figure above, you should check out Karl Heinz Kremer’s tutorial on Modify Dynamic PDF Stamps in Acrobat. Then, if you still find yourself searching for answers on how to customize your dynamic stamp, be sure to check out Thom Parker’s book on All About PDF Stamps in Acrobat and Paperless Workflows. It covers everything including using checkboxes and custom dialogs on dynamic stamps. So, now hopefully you have enough reference material to guide you through the process of creating, using, and customizing your dynamic stamps.